During mouse pancreatogenesis, endocrine cells are born from progenitors residing in an epithelial plexus niche called the ‘plexus state’, which comprises of a web-like epithelium arising around embryonic day E12.5 from within an anlage of multipotent progenitors (MPC). The progressive replacement of the plexus by an arbor-like ductal epithelium is associated with an abrupt reduction in the ability to produce new endocrine cells. Pancreatic endocrine cells are derived from a Notch-responsive Sox9+ progenitor pool via activation of the transcription factor and endocrine-lineage determinant Neurogenin 3 (Neurog3). Neurog3 is necessary and sufficient for endocrine-cell birth. Cells with high-level Neurog3 (Neurog3HI) exit the cell cycle, egress from the epithelium and cluster tightly with each other to form the nascent islets of Langerhans. Prevention of the acquisition of the Neurog3HI state causes cells to remain intra-epithelial and differentiate into non-endocrine acinar and ductal fates. Several studies have considered that Neurog3-expressing cells coordinate progenitor maintenance, cell fate allocation, and plexus morphogenesis, to mediate the appropriate growth and assembly of the mature ductal network and dispersed endocrine islets. The molecular motor nmMyoll acts on filamentous-actin (F-actin) substrates in apical constriction, tissue folding, cell delamination, and migration, and generation of inter and intra-cellular tension. Rho-associated kinase (ROCK) positively regulates nmMyoll activity but also functions as a modulator of actin remodeling, affecting tissue and cell change shape, cell polarization and migration. Together, nmMyoII and ROCK are important regulators of epithelial cell shape and morphogenesis. 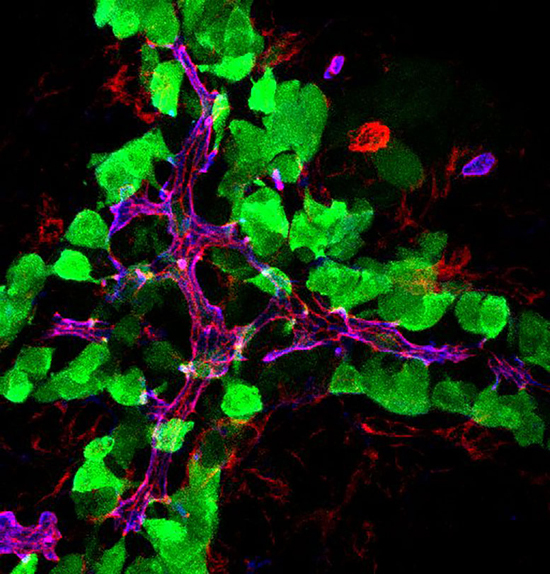 In recent research published in Development, Vanderbilt University scientists led by Professor Christopher Wright from the Vanderbilt Center for Stem Biology investigated in elegant and carefully designed studies the mechanistic interconnections between epithelial morphogenesis and cell-fate acquisition in the pancreatic plexus niche. They used three-dimensional tissue reconstructions, gene reporter analyses, and genetic and pharmacological interventions to study the interdependencies between Neurog3 gene activity, Notch signaling and ROCK/nmMyoll-controlled epithelial-cell morphogenesis. They proposed a model in which a circuit comprising ROCK-nmMyoll, Neurog3 gene dosage, and Notch signaling balances apportionment of endocrine cells from the plexus while still ensuring proper growth and morphogenesis of the pancreatic epithelium. The authors observed that the morphological transitions of the F-actin apical cortex are associated with cell-fate determination, and that apical-surface narrowing, further focalization, and complementary basalward cell displacement (with intensive filopodial protrusive activity), mark the Neurog3HI endocrine-committed state. They also observed that nmMyoll-dependent pathways mediate plexus morphogenesis and endocrine-cell birth, and that nmMyoll activity maintains the plexus state and promotes endocrine-cell differentiation. The research team focused at both cell and tissue-level resolution to understand the functional integration between programs of Neurog3-driven endocrine-fate determination, Notch-mediated progenitor maintenance, and ROCK/nmMyoll–mediated epithelial morphogenesis. Their study describes how the ROCK/nmMyoll pathway mediates a dissociable sequence of epithelial egression events linked to the acquisition of pre-endocrine–committed and endocrine-committed Neurog3-expressing states within the remodeling epithelial plexus. The authors propose that adaptive morphogenetic processes cooperate with Neurog3-dependent processes to together confer a robust and prolonged allocation of new endocrine cells from the epithelial progenitors in the plexus niche. Professor Christopher Wright and his colleagues, through their work, have been able to support and extend previous studies that postulate that differentiating endocrine-cells perform a ‘feedback control’ role mediating multiple developmental processes in the epithelial plexus niche, and extends the range of functions for Neurog3 during pancreatogenesis. The report will motivate further studies investigating the functions of transcription-factor determinants. 3D confocal z-stack (maximum projection) of embryonic murine (gestational day 15.5) pancreas epithelium. The apical lumen surface of the epithelial plexus niche is immunolabeled for Muc1 (blue). Early precursors of the pancreatic endocrine lineage – marked by Neurogenin3EGFP-reporter in green – are born from Sox9-producing mitotic progenitors (not shown) maintained within the plexus. These progenitors undergo apical narrowing (apical f-actin cortex in red) and basalward cell-body displacement driven by filopodial protrusive activity, concordant with the activation and upregulation of Neurog3, thereafter committing to the endocrine-cell lineage. 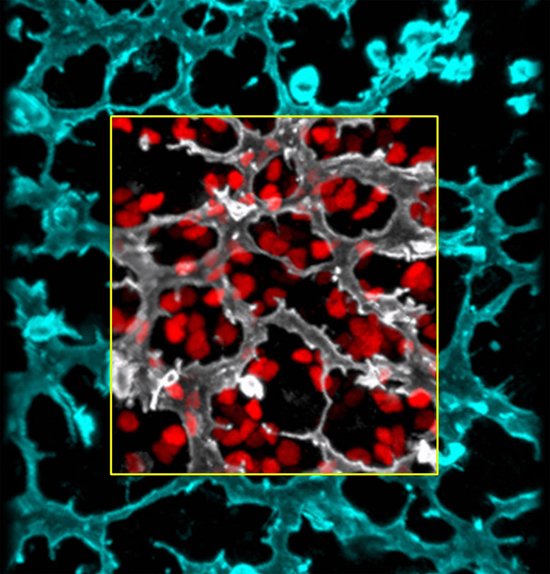 3D confocal z-stack (maximum projection) of embryonic murine (gestational day 15.5) pancreas epithelium. The apical lumen surface of the epithelial plexus niche is immunolabeled for Muc1 (magenta and white). Early precursors of the pancreatic endocrine lineage – nuclei marked by Neurogenin3 in red – are born from Sox9-producing mitotic progenitors (not shown) maintained within the epithelial plexus. Christopher Wright, D. Phil., is the Director of the Vanderbilt University Program in Developmental Biology, Associate Director of the Vanderbilt Center for Stem Cell Biology, Louise B. McGavock Chair and is Professor and Vice-Chair for Faculty Affairs of the Dept. Cell & Developmental Biology at Vanderbilt University, where he began his independent research program in 1990. In 2012, he became an elected member of the American Assoc. for Advancement of Science. Wright’s B.Sc. was from the University of Warwick, U.K., during which he received training with Drs. Alan Colman, Hugh Woodland, Liz Jones, Bob Old, and others. He gained his D. Phil. in 1984 in the lab of Dr. John Knowland at the University of Oxford (Linacre College) studying the biochemistry of steroid receptor control of gene expression. From 1985-1989 he carried out postdoctoral research first in Basel, Switzerland and then at UCLA, USA, under Dr. Eddy De Robertis, discovering some of the first mammalian homeobox genes, among them Pdx1 (known first as XlHbox1). Wright’s lab has studied intercellular signaling, transcriptional control of cell specification and differentiation, embryonic patterning and pancreas organogenesis. It was the first to apply lineage tracing and gene inactivation to show reallocation of stem cell properties from pancreas to duodenum (Nat. Gen. 2002). His lab has created and distributed many tools and reagents for studying pancreas development, islet cell differentiation and plasticity, pancreatic cancer, and has collaborated with many of the leading laboratories and colleagues in these fields. Under an inflammatory-signaling context of acinar injury caused by duct ligation, we showed that acini could transform into duct then endocrine cells [Pan et al., Development]. Wright was co- or lead organizer for two Keystone Diabetes meetings, and other leading developmental biology meetings. He has received research and training awards at Vanderbilt University, and is principal investigator of a 25-year duration institutional T32 award from the National Institutes of Health. He has chaired the DEV-1 Study Section for the NIH, and been standing or ad hoc member of several study sections over the last two decades. He has currently approx. 185 publications, viewable at http://www.ncbi.nlm.nih.gov/myncbi/browse/collection/40744028/ He has trained fourteen graduate students and 12 postdoctoral fellows, many of whom have premier positions at leading globally renowned institutions. Eric Bankaitis, Ph.D., is currently a Postdoctoral Fellow at the Center for Gastrointestinal Biology and Disease (CGIBD) at the University of North Carolina at Chapel Hill. Dr. Bankaitis’ B.S. in Biology and B.A. in Chemistry were from UNC Chapel Hill, were he began his formal scientific training in the labs of Dr. David Threadgill in Cancer Biology, and Dr. Zhi Lui in Dermatology. He completed his Ph.D. at Vanderbilt University in the Wright Lab in 2016, where he investigated how the morphogenetic mechanisms controlling cell and tissue morphogenesis interact with transcriptional programs driving cell-fate acquisition during mouse pancreas organogenesis. He was lead or co-author on several high impact publications during his doctoral training, including the first study to identify the epithelial ‘plexus’ as a developmental niche for progenitors of the endocrine lineage [Bankaitis, et. al.,Genes and Development], the discovery of a pre-commitment mitotic endocrine-progenitor state maintained within the ‘plexus’ epithelium [Bechard et. al., Genes and Development], and the demonstrations that apical polarization [Lof-Ohlin et. al., Nature Cell Biology] and ROCK-nmMyoII signaling [Bankaitis et. al. Development] are key mediators of endocrine fate commitment. During his graduate studies he assisted teaching in multiple graduate-level courses. Bankaitis was awarded a T32 training fellowship and an F32 NIH fellowship to continue training in the lab of Dr. Scott Magness, where he studies the transcriptional control of intestinal stem cell function during homeostasis and regeneration, and acts as mentor to multiple students in undergraduate research.